TRANSPORTATION OF THE INJURED LEARNING OBJECTIVE: Recognize the different forms of emergency transportation, and identify essential BLS equipment and supplies on Navy ambulances. Thus far we have dealt with emergency methods used to move an injured person out of danger and into a position where first aid can be administered. As we have seen, these emergency rescue procedures often involve substantial risk to the casualty and should be used only when clearly necessary. Once you have rescued the casualty from the immediate danger, SLOW DOWN! Casualties should not be moved before the type and extent of injuries are evaluated and the required emergency medical treatment is given. (The exception to this occurs, of course, when the situation dictates immediate movement for safety purposes. For example, it may be necessary to remove a casualty from a burning vehicle. The situation dictates that the urgency of casualty movement outweighs the need to administer emergency medical treatment.) 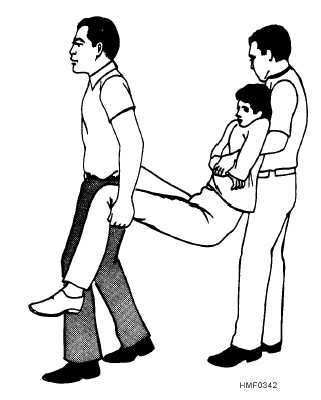 From this point on, handle and transport the casualty with every regard for the injuries that have been sustained. In the excitement and confusion that almost always accompany an accident, you are likely to feel rushed, wanting to do everything rapidly. To a certain extent, this is a reasonable feeling. Speed is essential in treating many injuries and in getting the casualty to a medical treatment facility. However, it is not reasonable to let yourself feel so hurried that you 3-24 Figure 340.Chair carry. 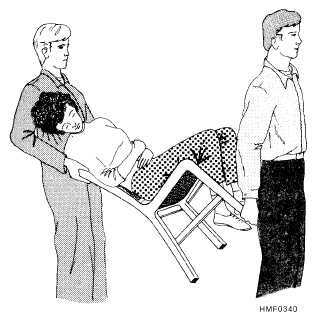 Figure 341.Two-person arm carry. 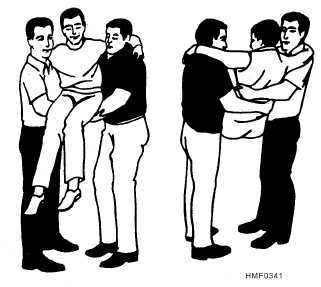 Figure 342.Two-person arm carry (alternate).